What's the lowdown on pit bull rescues and shelters vs. pit bull breeders? Anyone who has been seriously looking for a pit bull can't help but be amazed at the fees some breeders are charging these days. It can be both daunting and confusing. Is it really necessary to pay $500 - $2000 for a healthy, friendly, good-looking pit bull? Absolutely not. Pit bull rescues and local animal shelters are a great source of excellent pits. Especially when you consider that 25% of all dogs that are euthanized are pure breds. Pit bulls are currently the most over-bred dogs in our society. Sadly, the current excessive demand for them is fueled to a great extent by high-risk owners who often abuse and abandon them. 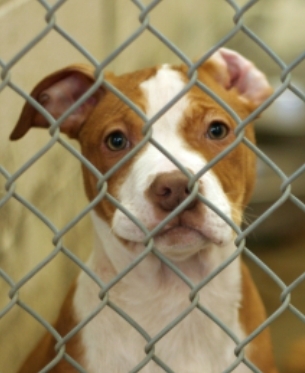 Consequently, it is estimated that only 1 in 600 pit bulls ever finds a permanent, loving home. That means the other 599 live all or part of their lives in shelters or on the streets where they eventually succumb to injury, disease or starvation. With statistics like these, it's for me hard to understand why so many people seem to think it's a good idea to breed more pit bulls at this time, let alone charge inflated prices like those mentioned above. But, the breeding industry is largely unregulated. Pretty much anyone can breed their dog, whether they know what they're doing or not. And, they can charge whatever they think the market will bear. It's very much a buyer beware type of situation. So, if you are looking for a family pet, why not get a great bully from one of the many pit bull rescues or animal shelters? If you really believe the best dogs come from breeders, here are some rescued pit bulls that may just change your mind. Bandog Dread, a rescued American Pit Bull Terrier, holds the record for winning the most performance titles of any dog of any breed for all time. Dread won titles in obedience, herding, Schutzhund (tracking and protection work) and weight pulling. He was rescued by author and trainer Diane Jessup when his original owner went to jail for drug dealing. When Kristine Crawford rescued Dakota, she thought she was just getting a companion for her first pit bull, Cheyenne who had gone through a false pregnancy. But, now along with a third pit named Tahoe, the "Crawford Team" is one of the most respected search and rescue teams in the country. They have been called in on such high-profile operations as the 2003 explosion of the Space Shuttle Columbia and the search for Laci Peterson. Then, there's K-9 Popsicle(Pictured left). It's hard to find a better "come-back kid" story than Popsicle. So named because he was found by police during a drug raid locked in a meat freezer. He was left for dead by his absentee owner who had used the puppy as bait to train his fighting dogs. Popsicle recovered from his injuries, but he was continually passed over for adoption by shelter visitors when they learned he was a pit bull. Fearing he might never be adopted, the shelter called U. S. Customs agent Sally Barr to evaluate Popsicle for their drug detection program. Of the 500 dogs Barr had tested in a 3 year period, only 4 were accepted and Popsicle made the cut. Shortly after graduating at the top of his class, Popsicle made the largest ever drug find at Port Hidalgo, Texas. He helped federal agents seize 3,075 lbs of cocaine from a pineapple truck. Popsicle eventually retired from government service. He was adopted by his U. S. Customs partner, Agent J. J. Trevino. 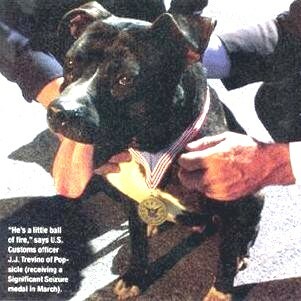 The picture above shows Popsicle wearing the Significant Seizure Medal he earned for the Hidalgo drug bust. If you like to play frisbee, you'll love this video. Wallace, a pit bull, was adopted from a shelter shortly before he would have been euthanized. Now, he and his owner compete in frisbee competitions across the nation. In less than 2 years Wallace became a top level disc dog champion. 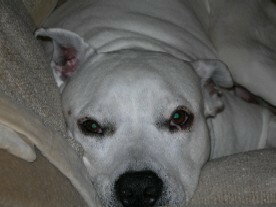 And, of course, there's my own shelter sweetie--Blanca. Blanca has no titles, no herioc accomplishments to her credit and she would sooner let a frisbee hit her in the head than try to catch it in the air. That's ok. She's quite simply the best dog I've ever had. So, where do you find a pit bull to adopt? You can always check out your local shelter. And, here are some nice pit bulls who are searching for a "forever home". For more information on the adoption process, visit the Dog Adoption and Training Guide. There you will find over 162 breed profiles along with lots of "how-to" tips for adoption, training and much more.